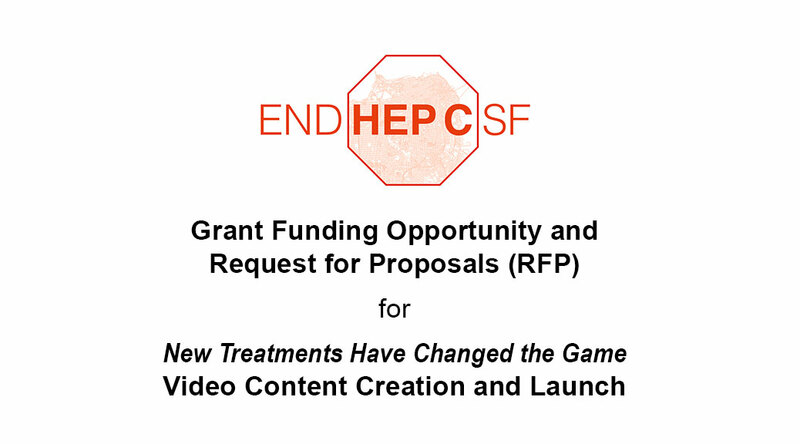 End Hep C SF seeks to award funding to a filmmaker who will help us design, create, and launch a successful video-based social marketing campaign that highlights the treatment successes and opportunities for people living with Hepatitis C (HCV) in San Francisco. Funding from this opportunity is intended to cover all costs associated with planning, shooting, editing, and launching the campaign, on behalf of and in partnership with End Hep C SF. Completed proposals must be received via email to Joanne Kay, at jkay@projectinform.org, by 5:00 pm on June 20, 2018. Late applications will not be accepted under any circumstances – no exceptions. Please click here to download the RFP, which has details of how to apply. Please send any questions to jkay@projectinform.org. We will post all questions and answers on this page as soon as possible. 1. The actual RFP document says a different date than what was on facebook? Can you clarify the due date? The due date is now 6/20/18. We had moved it back to give folks some more time and because of conflicting schedules on our end. 2. The RFP discusses video creation versus video launch. What do you mean by that and what is the role of the filmmaker in both? The filmmaker is in charge of working with members of the End Hep C SF initiative to create the video or videos for the campaign. They are to propose a plan for the campaign, including what type of videos should be created, how they should be created, and how they should be distributed (or “launched”), and then create the actual product(s). End Hep C SF will distribute through their social media, but would welcome additional support from the filmmaker regarding other ways to “launch” the final product. 3. Who is the target audience for this project? The proposal talks about people in marginalized populations but is that who we want to see the final product? The charge for the filmmaker is to create a product that will feature the voices/experiences of and resonate with people from marginalized communities, with an emphasis on people who use drugs, homeless folks, and people who have experienced incarceration. Ideally this video (or videos) would also resonate with others (i.e. the general population) too. 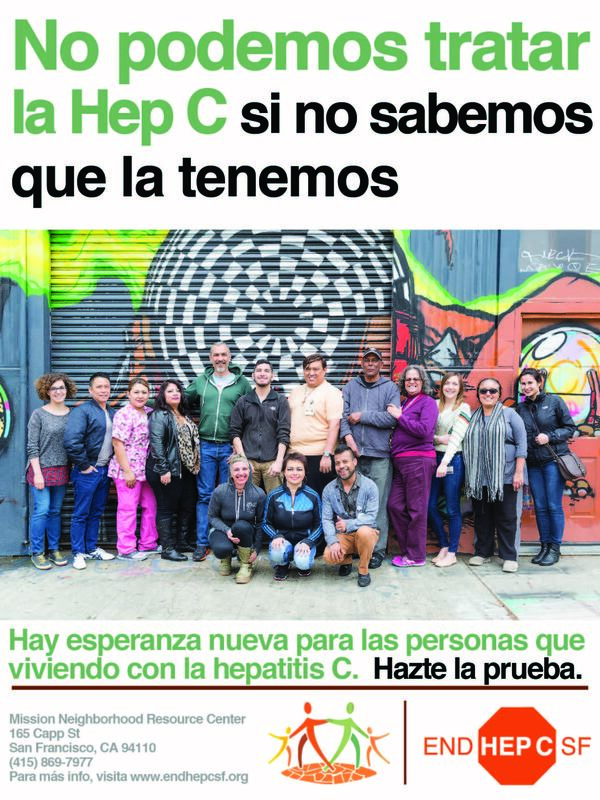 End Hep C SF has the subject matter expertise around HCV and engagement strategies for those most impacted by HCV, but we need support around how to best package the telling of their stories and the strategies the initiative has employed to support them. For this reason, we are interested in the suggestions of the filmmaker about how to put together a comprehensive campaign that is likely to have the greatest impact in uptake of HCV treatment and engagement in care. 4. The RFP referenced working collaboratively. What does that mean and what is the nature of End Hep C SF? The filmmaker will not make the video(s) in isolation. End Hep C SF members will want to be heavily involved in planning and execution of this project, in both a partnership and advisory role. We are a collaborative group (membership from 30+ agencies) with a shared leadership model (i.e. decision-making is decentralized). The various workgroups meet monthly and use GroupSite to converse in between meetings when needed. We are passionate and serious about our work but also have fun with each other and our clients. We are excited to facilitate the filmmaker’s work with our clients, but will also want to be closely involved to ensure it is a positive experience for everyone involved. 5. Is this video intended to be an extension of the “New Treatments Have Changed the Game” campaign featured on www.endhepcsf.org? That campaign came out of some work with Glide Foundation clients in 2015. Clients were asked about what they knew about HCV and the new treatments, and how we should be talking about it all. So in the sense that these messages were for and by drug users, we hope this new project will continue in that spirit. However, we want to use this opportunity to tell the story of what it means to be cured of HCV, and not just let folks know that it’s possible. We also want to highlight all the different ways people can access HCV treatment in San Francisco. It can be created as part of the original “New Treatments Have Changed the Game” brand, or it can be separate, intended to supplement that original campaign – we look forward to the filmmaker’s proposals for how they would handle this, and why. 6. With many clients, we include budget for additional video editing (and sometimes production+editing) AFTER a campaign launch. This allows us to review and revise based on evidence from initial social media engagement. Would this approach be possible with this project? The ceiling for the grant is $39,000. Anything you propose would have to fall beneath that cap, and be completed by the project end date of March 31, 2019. Understanding the maximum budget and timeframe, filmmakers are welcome to propose additional editing after the launch. 7. Trying to get a sense of the logistics for the creative strategy: Can you tell us more about the Prevention, Testing, and Linkage Workgroup? How many members are in the workgroup? How much time during the agenda can the filmmaker expect to have at each monthly meeting? Would it be possible to meet with some (or all) of the workgroup members more than once a month for some/all/or none of the 8 month timeline? The Prevention, Testing and Linkage work group is largely composed of providers from community-based organizations (i.e. Glide Foundation, the San Francisco AIDS Foundation, Shanti) who offer direct services such as syringe access, HIV/HCV community-based testing, HCV navigation, etc. It’s our largest work group with probably about 40 active members, and an average of 30-40 members at each monthly meeting. The filmmaker is expected to use the monthly meetings to check in and bounce ideas off the group, which will function in an advisory capacity for the project. Probably about 45 minutes to an hour of each monthly meeting could be spent discussing the project, but the filmmaker will be encouraged to meet with group members individually and in smaller groups as scheduling permits. This group has access to the target population and will help identify interview subjects, spaces to film, etc., as well as being directly involved in the activities arranged between filmmaker and clients. 8. Some of the language in the RFP could be interpreted several ways (see below***). To clarify: Will the contractor/filmmaker be expected to launch the videos OR Are you saying that that the contractor/filmmaker might make the videos and End Hep C SF might decide not to launch them? The filmmaker’s primary responsibility is to create the video, and support the launch. This may mean that some launch activities are handled by End Hep C SF and some are handled by the filmmaker – this distribution of workload depends on the filmmaker’s proposal and the final agreements made by the filmmaker and End Hep C SF at the time the contract is signed. End Hep C SF anticipates working closely with the filmmaker, and we fully intend to make sure that the final products are widely seen and enjoyed. 9. Can out of state companies submit proposals? Travel is not an approved expense for the project budget, so if an out of state filmmaker wants to submit a proposal, he or she should be prepared to cover their own travel costs. 10. As a cost saving measure, can meetings with Prevention, Testing, and Linkage workgroup of End Hep C SF be done through video conferencing? This is a possibility but not preferred. 11. Your funding ranges for $19,000 – 39,000. Are you looking to implement a $39,000 campaign or is your goal to spend less… and develop a smaller campaign for $19,000? We encourage candidates to submit the best proposal possible within the funding range. 12. In pricing, will priority be given to smaller campaign offerings with lower budgets? Again, we encourage candidates to submit the best proposal possible within the funding range. Priority will be given to proposals that provide the best combination of campaign comprehensiveness/reach and cost. 13. Is END HEP C requesting liability insurance from the filmmaker? 14. Can we submit more than one approach and budgets in the proposal?